In Beaverton, gutters are a critical component of every roof installation and they play an important role in the integrity of your roof’s structure. A failing or improperly gutter system can cause severe damage to your home and lead to costly roof repairs for your Beaverton area home. The purpose of the gutter system on your Beaverton Oregon home is to pull water away from your house and prevent water damage to your roof, walls, and foundation. Without a gutter system in Beaverton, your home could suffer damage to your siding, mold growth, water damage to your home’s foundation, soil erosion and damage to your landscaping, or complications caused by standing water on your roof. West Coast Roofing can help you replace the gutter system on your existing Beaverton home or properly design a gutter system for your new home in the Beaverton area. Or roofing technicians are highly trained to repair and replace Beaverton gutters. And we offer our Beaverton area customers a wide range of top quality options for gutter materials. 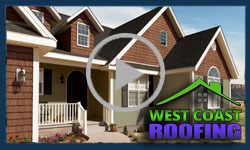 When you choose West Coast Roofing as your Beaverton gutter replacement experts, you can be assured that your home will be provided with a quality and aesthetically pleasing gutter system including mitered corners and a leak-free installation. We will use the latest technology allowed by your situation to affix the gutters and downspouts to your home so that they will withstand the harsh weather that the Beaverton area has to offer. We can also help you provide gutter guards for your Beaverton gutter system. Gutter guards will prevent your Beaverton gutters from filling with leaves, twigs, and other particles that build up inside your gutters. Not only is this debris difficult and time consuming to remove from your gutters, it prevents your gutter system from operating effectively and drawing water away from the roof of your Beaverton area home. A Beaverton gutter system is an often overlooked component of roofing installations in Beaverton. But the gutter system on your Beaverton area home provides important and cost-effective protection that will prolong the life of the roof on your Beaverton-area home. Contact West Coast Roofing today and we can help you repair or replace your Beaverton Oregon gutter system or design a complete system for your new home.